Denmark's Rainbow Band was formed in late 1969 as a supergroup consisting of Peer Frost (ex-Young Flowers), Lars Bisgaard (ex-Maxwells), Carsten Smedegaard (ex-Beefeaters), Bent Hesselmann and the former jazz players Niels Bronsted and Bo Stief (they had backed American jazz musicians at Copenhagen's Café Montmartre). The idea was to play jazz-influenced progressive rock in the style of Burnin' Red Ivanhoe and Traffic's second album. These influences were strongly evident on their 1970 album. It's a very good effort, still very indicative of the hippie era. The rhythm section still produced the powerful 60s beat, forcing Peer Frost to squeeze out some of his best guitar solos. Lars Bisgaard was replaced by Allan Mortensen (ex-Tears) at the end of 1970. A Canadian group was already using the name Rainbow Band, which forced the Danish group to change their name into Midnight Sun in July 1971. Surprisingly enough, they decided to remake their first album instead of moving on to new material. 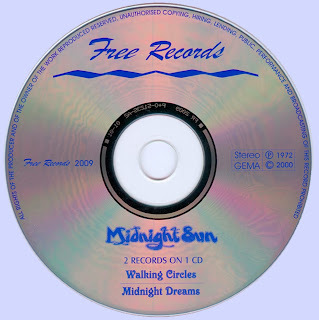 "Walking Circles" and "Midnight Dream" are their second and third albums. This is well-crafted progressive jazz with plenty of funky rhythms with great guitar and occasional tight brass that hits the spot. 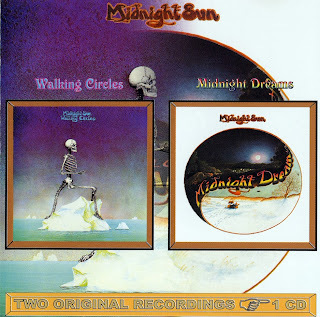 The Walking Circles album features cover art by Roger Dean, as did their debut. Pear Frost is said to be Denmark’s finest guitarist from this time period. Some similarities to 60’s era Traffic and Burning Red Ivanhoe. 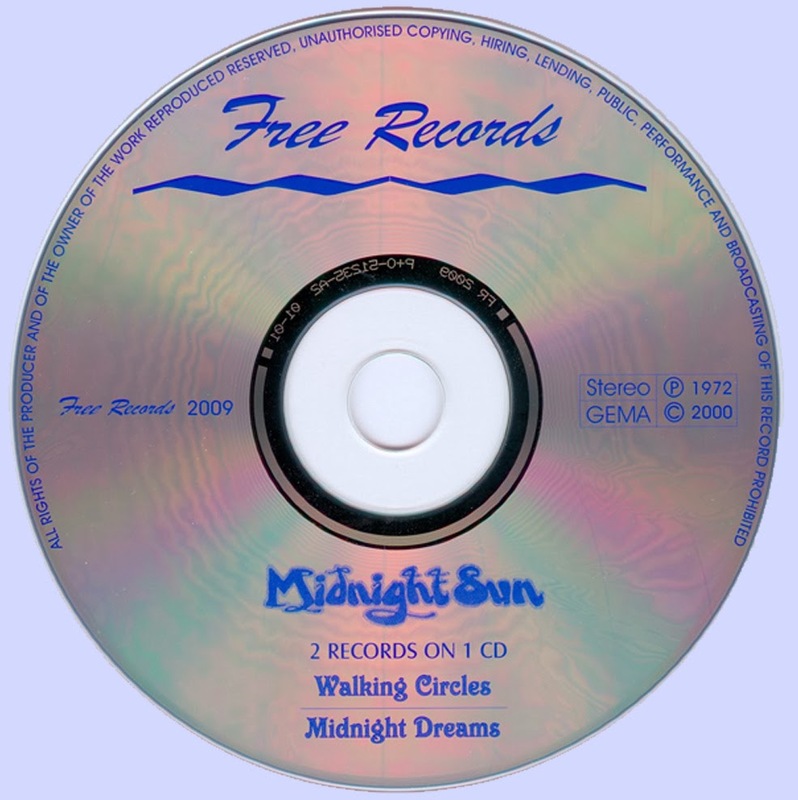 The powerful instrumental "A La Turca" from "Walking Circles" has many trademarks of Midnight Sun at their best; melodic, jazzy saxophone and piano blended with heavy riffs and some outstanding soloing. This level of quality continues in "The Way of Zen", but in a very different musical frame, as this is a laidback and atmospheric ballad based mostly around the piano and some ethereal flute. Stief's acoustic bass also makes a return here. But the record unfortunately decreases into mediocrity again with "I've Got A New Mind" that opens the second side in a not very promising way. Luckily, the band goes back to form for the rest of the album. "Winds Gonna Blow" opens with some beautiful, jazzy flute-themes and also has a nice string-arrangement that further enhances the strong melody. Definitively one of the best on the record. The title-track is the most complex piece here, with the el-piano playing one of the main roles. "I'm Living A Dream" is very short but good, mid-tempo jazzy song that closes this partly uneven but still worthwhile album.